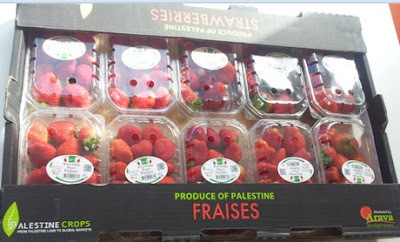 Arava, a prominent export company from Israel, has recently declared the commencement of the strawberry season in the Gaza Strip. This unique cooperation between Arava Export Growers Ltd. and the Growers' Societies in the Gaza Strip promote commerce and shared interests. "It goes without saying that we are all committed equally to see this venture through and bring prosperous financial success to both sides as well as strengthen relationships between Israel and the Gaza Strip" claimed Arava. The season itself it expected to last till mid-February with cumulative amounts of approximately 400 tons of fruit. The variety chosen this year is Tamar, a very well known specimen of strawberry which is best characterized by its sweet flavor, tenderness and, extended shelf life. To add some spice and differentiation, Arava Export Growers Ltd. had taken upon itself the task of branding this year's yield by perfecting the sorting process for better consistency and quality. In addition to that, Arava is introducing a new line of packaging that includes black boxes, designed punnets and attractive stickers. "This action is for the benefit of ensuring superior quality, consistency and, distinctiveness. We want to make sure that European markets will be well aware of the Gaza Strawberries and, consciously, place them on a higher rank than the competition". In recent months steps had been made by Palestinian Crops to certify all growers with a Global Gap certificate and, at the same time, implement a strict protocol for MRL residue levels. Omer Kamp, of Arava, said "It is with great pride that we can proclaim to have tested the fields with ZERO tolerance and yet, achieve full success. All growers are now certified and, with no exception, MRL tests came out clean. "It is essential to point out that many efforts were given for this season to succeed. Aside from the technical issues, the growers and Arava are fully committed to show the benefits of mutual cooperation and how it could make a difference in perceptions." 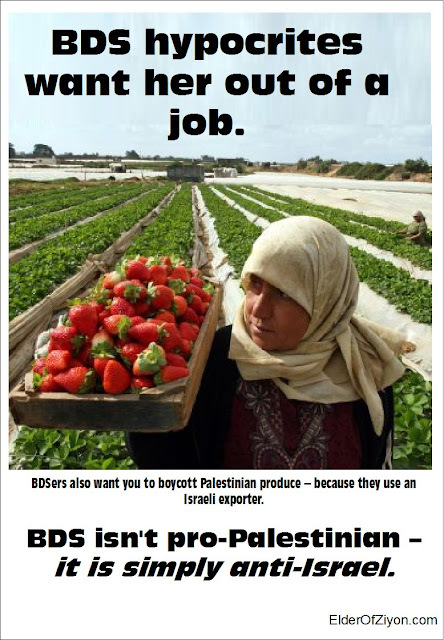 We have seen that the Israel boycotters have also boycotted exporters of produce from Palestinian Arab farmers - because to these hypocrites, it is more important to hurt Israeli companies than it is to help Palestinian Arabs! From this article you can see that Arava adds value to the products, and is actively marketing them to European wholesalers. It is a true partnership between Israelis and Gazans, Arava isn't marketing the strawberries as Israeli, but is attempting to help brand Gaza as a source for high-quality produce! 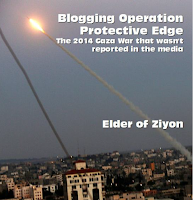 Arava's actions today can help Gazans for decades. 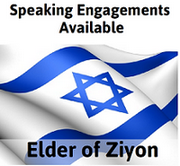 It is exactly what people who espouse peace say they want to see. 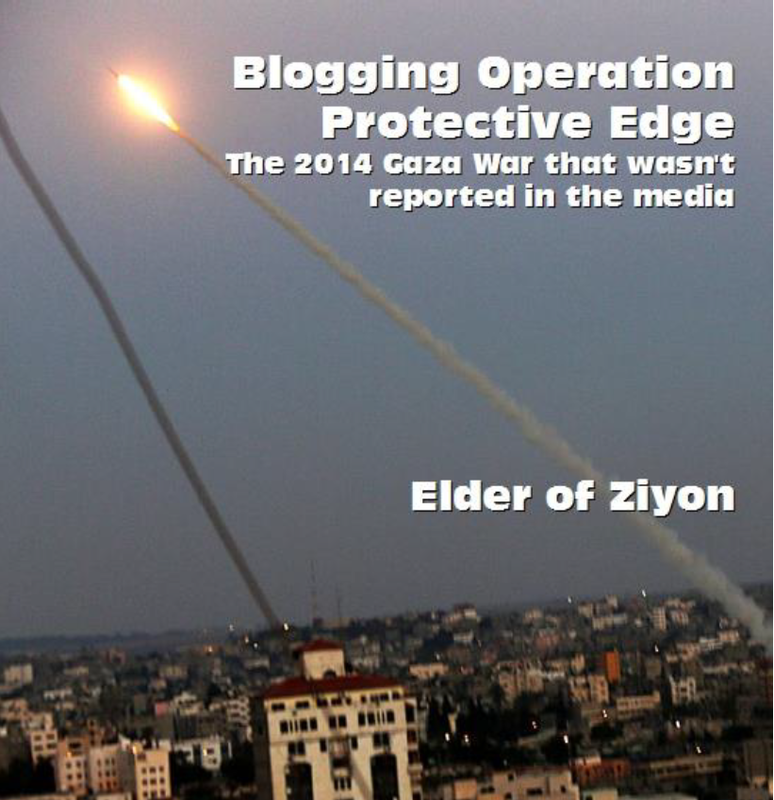 But Arava is also on the boycotters' lists. Here we have a list of EU wholesalers that sell Gaza produce, which are marked "Produce of Palestine" and labeled Palestine Crops. The boycott crowd, that pretends to be pro-Palestinian, wants you to avoid buying anything that says "Produce of Palestine." Orwell himself couldn't have made this up.